Adobe at the Photoshop World conference this morning showed off a version of Photoshop for the iPad that could give the tablet real Photoshop image editing. Unlike the mostly filter-based Photoshop Express, the unnamed version would let users add, switch to, and edit layers with an isometric view to show the different layers at a glance. Other additions should bring image objects that can be dragged and rotated as well as a color mixer that allows blending "like a painter." 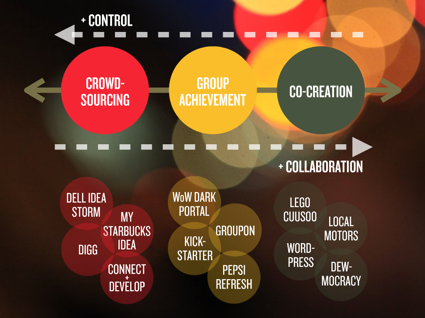 Great slide from Saneel Radia's Slideshare presentation Innovation & Collaboration. Where does your organization fit on the spectrum? Probably skewed toward control - organizations like control! What Can We Learn About Education and Innovation From the 3rd World? Great line from Harry McCracken (yes, that's his real name). I had a spirited discussion with some colleagues Friday regarding Apple's stance on Adobe Flash on iOS devices (iPhones, iPads, iPod touches). The general consensus seems to be that technically it can be done, but that Apple is banning Flash so that users will have to pay for apps from their app store - simply said, greed! I debunked those arguments on a number of fronts - or at least I tried to. #1 - The iPhone has existed since June of 2007. Show me the mobile devices that run Flash well and do not kill battery life. They don't exist! Four years later and Flash on mobile devices is still buggy and kills battery life. Adobe's best strategy to force Apple to change their stance on Flash was to get Flash working well on every competitors mobile device, thereby proving Apple wrong! Had that happened, Apple would no longer be able to make the technical and performance case against Flash. #2 - When I noted that I keep Flash disabled on my MacBook Air, because it kills battery life. A colleague - with a MacBook Pro - opined that he never had a problem, but then admitted that he always kept his laptop plugged it. #3 - I asked what applications/sites were missing on iOS due to the lack of Flash. Someone mentioned the web-based version of AIM (AOL Instant Messenger). A quick search found about a half dozen iPhone and iPad apps that support AIM. Anyway, who still uses AIM? All joking aside, I'm sure there are plenty of sites with Flash that can't be viewed on an iPad or iPhone, but I rarely encounter a site mobile Safari can't render. I watched Best of Show on Amazon Video on Demand in hopes of performing an informal battery test. It drained the battery from 44% full to 15% full in one hour and 20 minutes. But during that time, the audio got out of sync, and then the picture froze–and I couldn’t get Flash to work properly again without rebooting the Xoom. At that point, I gave up with the battery test. Some other standard-definition video I tried, such as that at Bloggingheads.tv, worked reasonably well. I tried Bejeweled on Facebook; it was playable, but the animation was herky-jerky. Hulu, as I expected, blocks Flash Player on the Xoom. Google’s Picnik photo editor sort of works–I could load photos and apply effects. But the sliders that are everywhere in the interface don’t function properly; I don’t think they really understand touch input. All in all, it seems to be a version of Flash that works some of the time but not always, and not always well. That’s not, um, ideal. Maybe this is where MS can innovate? Microsoft is claiming responsibility for the takedown of the massive Rustock botnet, which stopped sending out spam midmorning March 16. I have been waiting for RIM to show the world that one big last thing that would drive the masses to by the PlayBook. That one thing that nobody else has, that will drive everyone crazy. Yesterday, they did it. RIM announced an emulator to run Android apps. An emulator. That is the big thing for RIM. This is what makes the PlayBook better than an other tablets on the market. An emulator. So, let me see if I have this right. The PlayBook hardware copies the iPad; the PlayBook operating system copies Apple’s iOS and Palm’s WebOS; and because it has no apps of its own, RIM makes an emulator so its users can load another platform’s apps on its device. You almost have to wonder when the Commodore 64 emulator will come to the PlayBook. Really, if you’re going to screw your customers, why not go all the way. Hutch co-founder Chris Dixon on his co-founder Tom Pinckney's path to higher ed. Interesting - getting into college based on what you can do, not your GPA, SAT scores, and extracurricular activities. As institutions - colleges, universities, and business - increasingly look at competency-based evaluation of candidates, I think this will become a more common trend. My friend and business partner Tom started two companies with me and one company before. He invented many non-trivial patented inventions and raised many millions of dollars in venture capital, and returned capital to those investors many times over. He got his Bachelors and Master degrees from MIT. He's the nicest, smartest, and most decent guy you'll ever meet. Tom grew up in rural South Carolina and mostly stayed at home writing video games on his Apple II. There was no place nearby to go to high school. He took a few community college classes but none of those places could give him a high school degree. It didn't really matter - all he wanted to do was program computers. So when it came time to apply to college, Tom just printed out a pile of code he wrote and sent it to colleges. Stanford, Berkeley and everyone else summarily dismissed his application on technical grounds - he didn't have a high school diploma. MIT looked at his code and said, "we like it" - we accept you. For his Masters the best four CS schools - Stanford, Berkeley, Carniegie Mellon, and MIT -- all recruited Tom He stayed at MIT, the school that gave him a chance without a high school degree. Great list from Shelley Blake-Plock. Click the link - 21 Things That Will Become Obsolete in Education by 2020 - to read a more detailed explanation of each. My favorites? Computers, Desks, Homework, Fear of Wikipedia, and IT Departments. I love the show How It's Made. This reminds me of the episode on the making of oil paint. We use SketchUp in our CADD and Architecture courses. Very quick, intuitive and easy to use 3D modeling. Definitely worth downloading. Everyone has Androids, iPhones and Blackberrys right, so this is no big deal? Think again! Feature phones may have lost much of their cache to smartphones over the past few years, but they are still relied upon by almost 80 percent of the world's mobile phone users, the researchers said. If you own or manage any kind of website, you need to be using Google Analytics. The experience - a few years ago - of watching my daughter persist in mastering a snowboarding video game, while struggling with her math homework convinced me that video games could have a huge impact in education. We haven't seen it yet, but somebody is going to figure it out and make a fortune in the process. According to 2008 figures from the Pew Research Center, 97% of today's K-12 students spend many hours each week playing video games. By the time they graduate from high school they will have spent some 10,000 hours doing so. During the course of that game play, they will acquire a vast amount of knowledge about the imaginary worlds portrayed in the games, they will often practice a skill many times until they are fluent in it, and they will attempt to solve a particular challenge many times in order to advance in a game. Would that they devoted some of that time and effort to their schoolwork! Since video games first began to appear, many educators have expressed the opinion that they offer huge potential for education. The most obvious feature of video games driving this conclusion is the degree to which games engage their players. Any parent who has watched a child spend hours deeply engrossed in a video game, often repeating a particular action many times, will at some time have thought, "Gee, I wish my child would put just one tenth of the same time and effort into their math homework." That sentiment was certainly what first got me thinking about educational uses of video games 25 years ago. "Why not make the challenges the player faces in the game mathematical ones?" I wondered at the time. One problem with the majority of math ed video games on the market today that will quickly strike anyone who takes a look, is that they are little more than a forced marriage of video game technology and traditional mathematics pedagogy. For better or worse I have never been a huge “video guy” — always into photography and never that much interested in motion photography. I have though over there years tried piecing together crappy video clips I have taken with various versions of iMovie. Even screencasts that I recorded resulted in a frustrating video editing experience. What I learned is this: editing video on the iPad is the only way to go. I can’t see a need for ever wanting to edit on my Mac again. iMovie for the iPad really hits a sweet spot and that sweet spot is called user experience. It offers a grand user experience. I think the iPad is really starting to find its spot in my life. Great presentation on gaming from last week's South by Southwest conference! Although these are Camtasia specific, these tips from TechSmith provide some great basic guidelines for recording video. Record clips longer than 30 seconds. Hover the cursor where you want the viewer to look. 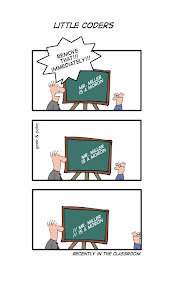 Do not “talk” with the cursor. Keep the cursor close when entering text. Use the mouse scroll wheel (if applicable). ... 3.38 million devices since launch. Are these sales to end users or distribution to stores? Someone in the comments points out that, in the Netherlands, these phones - for the hardware they offer - are the cheapest on the market. Earlier, I discussed Danny Tuppeny's frustrations with Microsoft's Windows Phone 7. His post has gone viral and gotten the attention of Microsoft. In calls from Microsoft, Tuppeny received promising responses to most of his issues - except the slow pace of OS updates. Trying to clamp down on bad PR from a loyal user/developer is one - actually delivering on these promises is another. When HP announced that they were going to be buying Palm early last year, we were all eagerly awaiting to see what changes would come to the brand. As those changes were found out by the public through numerous leaks and announcements, the webOS community began to get really excited. I received dozens of phone calls from developers looking to build new applications using advanced webOS 2.0 API's and integrating features like Just Type and Exhibition Mode. People were genuinely happy with the future that HP was showing us. Fast-forward to today, just after the February 9th announcements and release of webOS 2.1 on the Pre 2, and you may notice something peculiar. The development community has slowed down dramatically, and it's starting to look like some have jumped ship just as things are starting to get exciting again. HP has delivered on the goods that they promised, and no we find ourselves with a lack of new apps to play with that are build for webOS 2.x devices. To see what I mean, open up your webOS 2.x App Catalog (or find someone who can do it for you) and look for apps that tie into the new API's. While two dozen is twice as many apps than were released on the original launch day Pre, that's a far cry from what was expected from us a few months ago. And considering how many apps don't work in 2.0 because the developers haven't updated them yet (from 1.4.5), we may actually have fewer apps available for the Pre 2 (and the many hacked devices out there with 2.1) than on a device with webOS 1.4.5 installed. A mostly negative account of putting iPads into the hands of students and faculty. Unfortunately, I don't think they're actually "integrating" the iPads into teaching and learning. Instead, it seems like they're treating iPads as laptop replacements. Bringing iPads (or any other mobile device) into the classroom requires greater institutional, faculty, staff, and student commitment. Assignments, activities, faculty-student interaction have to all be built around the device. This may require creating new assignments, modifying existing assignments, creating custom applications, and customizing your infrastructure for these devices. An iPad initiative should take advantage of the special capabilities of the devices, but also account for the limitations. Even students have issues. When the University of Notre Dame tested iPads in a management class, students said the finger-based interface on its glassy surface was not good for taking class notes and didn't allow them to mark up readings. For their online final exam, 39 of the 40 students put away their iPads in favor a laptop, because of concerns that the Apple tablet might not save their material. "When they're working on something important, it kind of freaks them out," says Corey M. Angst, the assistant professor of management who tested the tablets. Honeywell Phase 3 Display Units (DUs) have shown themselves susceptible to "blanking" during airline electro magnetic interference (EMI) certification testing of wireless broadband systems (Wi-Fi) on various Boeing 737NG airplanes, prompting Boeing to cease linefit installs of in-flight connectivity systems across its portfolio, including widebody aircraft. Multiple sources tell ATI and Flightgloal that the blanking occurred during EMI testing for Aircell's Gogo in-flight Internet supplemental type certificate on 737NG aircraft. Aircell has declined comment, saying "this topic is not Aircell specific and, as such, we do not have any comment on the matter". Boeing says it has deferred the activation of wireless systems that interface with passenger devices that could potentially interfere with the DU 3 displays. "Boeing has not delivered any installations that would have this issue. Honeywell has assured us that they are working to address the problem and we are satisfied that they are taking the necessary steps to do so," says Bret Jensen with BCA Engineering Communications. So why aren’t we seeing Flash-enabled browsers on tablets? Plenty of manufacturers have announced Flash capability but we’ve seen little evidence of it running well. Unfortunately, it turns out that Flash Wars is more than just a bit of industry politicking: there are some very tricky technical problems to implementing Flash on an embedded processor – and it’s not going to be solved by locking programmers into a room and yelling “fix it!” at them. Flash was designed in the mid-90s for PCs and the new Internet era to display multimedia content in a web browser. It decodes video in software, combines the video and graphics in software, synchronizes the video and audio in software, handles Internet dropouts in software, and copies the results as fast as possible into the web browser. It relies on the CPU being fast and handling RAM accesses very quickly. Getting Flash to run on a tablet efficiently means that the video must be handled by a hardware video decoder, like the digital TV set-top box does. And indeed, Apple’s iPad can do 720p HD video decode without breaking a sweat (as anyone who has used an iPad to watch movies knows – it hardly dents the battery at all). Unfortunately, we are only just now seeing embedded processors with this kind of video handling hardware coming to market and Flash needs to be adapted to use this hardware. I can’t see how we are going to see tablets that can do a good job of showing HD video from Flash web sites until we get tablets with embedded processors that are up to the job and the system software developed to use that hardware properly. If anyone tells you they have a tablet that does Flash video really well, arch your eyebrow in a Spock-like skeptical manner and ask to see it. Long article from Danny Tuppeny, but worth the time. He details his frustrations with Microsoft's Windows Phone 7 and his doubts regarding the future of the platform. Not good news following the death of the Zune. This is a pretty long post, but it's the only way to get across why I'm suddenly so disappointed in Windows Phone 7 - a platform I've been so excited about for so long. I really hope someone on the WP7 team takes the time to read it to the end. I'm probably not unique in having these feelings. Hopefully if you've read this far, you now know why I'm starting to have serious doubts about Windows Phone 7. If Microsoft can't turn around bugfixes in a timely fashion, what's going to happen when people start finding exploits (and they will find exploits)? Of course, if I'm not confident in the platform as a user, I can't be as a developer. I've put my Windows Phone 7 development on hold. I can't commit to spending more time on a platform that Microsoft seems to be sending the way of previous versions. I still believe the OS is excellent, but sadly, that's only half the battle. Consider Martin Sauter's mobile's from 10 years age and how far we've come. I imagine that in 10 years our devices, their interfaces, and the speed of our networks will seem antiquated. We'll wonder how we ever managed with 1-2 Mbps on our 3G networks or 25 Mbps on our home networks. Where will the speeds be in 10 years? Consider that in mid-2007, when the 1st iPhone was launched, Apple did not consider 3G coverage sufficient or the chips mature enough to support in their breakthrough device - instead opting for AT&T's slower Edge network. That wasn't even 4 years ago! Today 3G is nearly ubiquitous (expect- sadly - on AT&T's network) and many phones and carriers are selling 4G devices and services. Apple is again waiting for coverage and chip maturity, but don't be surprised if we see 4G-capable iOS devices as early as this summer. So back to the question - what will our networks look like in 10 years? I think we'll continue to see the exponential growth of speeds on our data networks, as well as "micro-cell" technology that provides better coverage and requires less power from our mobile devices. The devices will continue to get thinner and smaller - while improving the features available, but there's a limit to how small these devices can get. Compare the size of 2001's Palm III (above) to today's iPhone or any Android phone - while the devices are infinitely more powerful, the form factors have not changed as dramatically. The interface is another area where I think we'll see significant innovation. Google and Apple (to a lesser degree) are already integrating voice-controlled operation into their interfaces. As voice-control becomes increasingly common, I think we'll also see device makers experimenting with a variety of virtual keyboards and interfaces. These will not be onscreen virtual keyboards, but instead natural user interfaces projected onto a surface or into the air - possibly using some sort of combination of motion-capture and holographic projection. Interestingly, Microsoft - with their market-leading, Guinness record-breaking Kinect has the lead here and could be the company to innovate here. Have a look at the picture on the left that I recently re-discovered. It's back from 2001 and shows the mobile devices I was using at the time. A Siemens S25 GSM mobile, no GPRS yet and a Palm III. Internet connectivity for email and some very very basic black and white web browsing over and infrared link and a circuit switched data connection (9.6 or 14.4 kbit/s) to an analog fixed line modem of an internet service provider. And that was only 10 years ago! Interesting to compare that to the gigahertz powered processors we have in mobile devices now, gigabytes of Flash RAM and display resolutions equaling that of desktop PCs of the time. It's time to dust off that great American novel that's been sitting in your closet! Two great stories on how independent authors are making a good living by self-publishing their works directly to Amazon - at a fraction of the cost of publisher e-books. The low cost generates volume. This trend should lead to more authors (and wannabe authors) opting for self-publishing, as well as pressuring publishers to lower the cost of e-books. More authors, more variety, cheaper books - all good for the consumer. "Joe Konrath has an interesting interview with independent writer John Locke who currently holds the coveted #1 spot in the Amazon Top 100 and has sold just over 350,000 downloads on Kindle of his 99 cent books since January 1st of this year, which, with a royalty rate of 35%, is an annual income well over $500k. Locke says that 99 cents is the magic number and adds that when he lowered the price of his book The List from $2.99 to 99 cents, he started selling 20 times as many copies — about 800 a day, turning his loss lead into his biggest earner. 'These days the buying public looks at a $9.95 eBook and pauses. It's not an automatic sale,' says Locke. 'And the reason it's not is because the buyer knows when an eBook is priced ten times higher than it has to be. And so the buyer pauses. And it is in this pause—this golden, sweet-scented pause—that we independent authors gain the advantage, because we offer incredible value.' Kevin Kelly predicts that within 5 years all digital books will cost 99 cents. 'I don't think publishers are ready for how low book prices will go,' writes Kelly. 'It seems insane, dangerous, life threatening, but inevitable.'" Once the machine is started, the motor begins spinning the lock and the solenoid yanks on the latch until the combination is discovered, which takes a maximum of about two hours to complete. A Distributed Antenna System, or DAS, is a network of smaller, spatially separated antenna nodes connected to the communications network. A DAS network splits the transmitted signal among several smaller antennas to provide coverage and reliability over the same area as a single cell tower antenna. DAS networks are effective in areas with difficult topography, structural impediments (e.g. buildings, or within buildings), or in locations where, for a variety of reasons, it is not optimal to build a traditional macro sites. If all goes according to AT&T’s wishes, the city of Palo Alto may soon become the premier testing spot for Ma Bell’s plan to boost its cellular network power by installing a large number of small cellular antennas around town. Ostensibly billed as a method for AT&T to overcome terrestrial and urban challenges in Palo Alto, the small-antenna plan for Silicon Valley’s cultural nexus is also part of a big nationwide push of Distributed Antenna System (DAS) technology deployment by AT&T to help Ma Bell get its overtaxed cellular network back up to speed. Historically used to improve cellular coverage inside buildings, DAS is basically a method to deploy a series of synchronized smaller antennas instead of a larger, cellular antenna array, such as those found atop buildings or on the unsightly antenna towers that are now a common part of the urban landscape. Inside a building, a DAS can help improve cellular reception by bringing small antennas closer to users inside, who then don’t have to connect their cell phones through walls or windows. A typical DAS system might then route the internal antenna connections to a stronger antenna connection on the roof to link to the parent cellular network, improving throughput while conserving device and antenna power. In Palo Alto AT&T is proposing to build out about 80 new DAS tower sites, placing them atop regular utility poles in and around Palo Alto’s leafy downtown area. If the plan wins city approval Palo Alto’s AT&T customers should see marked improvement in cellular connectivity, simply due to the increased number of available towers that can connect iPhones and other devices back to AT&T’s network. According to AT&T’s extensive Palo Alto wireless information web site, the proposal has been submitted to the city but no decision has yet been made. 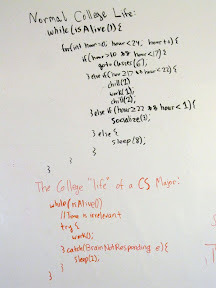 Great encapsulation of life as a CS major! I visited the line at a local mall. The lines were pretty long! So what if the Xoom’s sales aren’t exactly zooming right now? If Adobe Flash would work with the Xoom (a beta is coming 3/18/11, we’re told), if Google can fix the bugs in the Xoom’s Android 3 (Honeycomb) OS, and if Motorola can somehow lower its prices, in our opinion, the Xoom still has a chance. Competition is good. Whether you're new to Slideshare or a veteran trying to get your friends and colleagues on board, you'll love this great intro to Slideshare. Is it just me, or is this guy (see quoted story below) crazy? The Kno promo video looks interesting, but where are they? I haven't seen any - anywhere. the iPad and the majority of its competitors are focusing on a very narrow view of what the tablet can do. As currently designed, tablets are basically expensive video game consoles used as a means to access the Internet, email, and books. But the true potential of the tablet is not in its ability to replace the video game console or the television. Rather, the tablet has the potential to improve our productivity. While the iPad 2 makes some strides in this direction compared to the original iPad (especially with the stronger processor), the focus of most of the enhancements are aimed at improving the entertainment value of the device. But it is just stronger processing power along with a mindset towards increasing our capacity to do things--not just playing games--which represents the future of the Tablet. Recently, a tiny start-up company has built a tablet explicitly designed for students that just might give us a glimpse of the future. The tablet is called the Kno and it has all of the standard functionality of the iPad, such as a touch screen with the ability to rotate on demand, but it really emphasizes the ability to take notes and seamlessly integrate your own thought with the information that you are reading. Dr. Atala and his team are leading the way in the burgeoning field of bioprinting, which is exactly what it sounds like -- using printers (and sometimes the actual printer cartridges you'd use in your home or office machine) to print cells and biocompatible materials. Other major players in the field, like Organovo, have printed things including blood vessels, WIRED reports. So the field exists, yes, and the technology is improving. But the kidney-shaped mold that Atala showed at TED was exactly that -- a mold, without the vessels or internal structures of an actual, working kidney. The hope, Wake Forest says, is that one day, the same printer from the talk will be used to print actual tissues and organs, but that day is "many years from now." Another Atala-team advance that has gotten a lot of attention, but again, still looms on the horizon is using bioprinting to create new skin directly on wounds or, Marketplace reports, burn victims. In his speech at the TED conference, Atala said that he and his team are actively designing a printer prototype that would do exactly that. Interesting thought from Clay Shirky. Is it surprising that employees, students, faculty, etc spend time on Facebook, Twitter, e-mail or shopping online? I don't think so, when we've created an environment that allows "work" to invade their personal life, shouldn't we expect their personal lives to invade work? I'd love to be able to do my job without looking at e-mail at night or on the weekends, but we've created an expectation that we're always available for work. A famous observation about the net generation, the millennials, is, “They’re doing Facebook at their desks on a Tuesday morning,” which is certainly true. One of the reasons for that is that they’re also being asked to use PowerPoint in their homes on a Saturday afternoon. If you went to any manager and said, “Would you offer your 25-year-olds the following bargain: no more Facebook at work, and in return for which, I won’t call you after 6 PM or on weekends or ask you to watch e-mail.” I don’t think the managers would make that deal. I don't disagree, but it's not only them being asked to do same. Amazing to watch this attack accelerate! The movie shown below shows a real cyber attack on a honeypot VOIP server extension. Now, it is one thing is to look at some amazing meaningful moving imagery, it is another is to fully comprehend it. So here we go... The imagery shown is based on real data from a real attack. The 'balls' on the right represent some hacker attempting to crack a VOIP server. The balls on the left represent the server's response to the attack. The balls crash into each other and fight it out in the middle of the battlefield. The good balls do better, in this case. Although the attack is relentless and fast-paced, the volume of data from this one attack on a single IP/port (here UDP 5060 for SIP sessions) is really a drop in the ocean in terms of the wider internet. The visualization is created via a Ruby-based tool called "gltail", which is specifically designed to visualize Apache web server logs in real-time. With highly automated and blindingly fast scripting tools, crooks scan the internet looking for these VOIP servers. When found, the tool cracks the passwords on the extensions. Calls can then be made using these passwords. Victims only notice something is wrong when the next phone bill arrives, so there is a 1-2 month window in which the cracked address can be sold and used for illegitimate international calls. Analyst Mark Moskowitz of J.P. Morgan Research predicts the success of the iPad 2 will cause oversupply problems for competing tablet manufacturers. Moskowitz claims manufacturers looking to compete with the iPad 2 have extremely ambitious build plans that will hurt them in the long run. According to his analysis, tablet makers could build up to 65.1 million tablets in 2011, a number which greatly exceeds his estimate of 47.9 million in unit sales. This enthusiasm to duplicate the iPad's success could lead to an oversupply in tablets and components used to build these tablets. In a worst case scenario, tablet makers may have an oversupply of 51%. In December at the Convergence Technology Center's Winter Retreat at Collin College in Frisco Texas, John had the chance to shoot an IPv6 (Internet Protocol version 6) workshop given by Sam Bowne, from City College of San Francisco. Here's the 35 minute and 47 second Part 1 of the 4 part series. I've also embedded parts 2, 3, and 4. Great resource to empower and engage your students. Interesting question - I would say yes, mobile learning does increase completion rates. I think it provides students an opportunity fill those interstitial moments - the bus ride, waiting for the bus, TV commercials, waiting in line at the store, etc - with little bursts of mobile learning. I've seen some evidence that learners are more likely to complete mobile learning courses (like the ones created with mLearning Studio) than traditional online courses. I assume this is because it is more convenient and thereby more enjoyable, removing the tedious barrier of having to sit in one place to get it done. Also, learners can do smaller chunks when they have time: waiting in line at the grocery store, at a restaurant, and on and on (think of all of the places we now compulsively pull out our mobile device while we wait). This reminds me of a trend I think I heard mentioned on the radio (though I can't find a link to it online): more people are reading the news because they can access it on mobile devices. This all fits into a larger pattern. If it is easier, it's more likely to get done. 'No duh,' you might say. I agree. But it has profound implications for training. Perhaps the ease of access via mobile devices will help us become more likely to be lifelong learners in our careers and other areas of life. Very cool - nothing like this when I was a kid. This year the program will run through July 26-30, 2010. The program is run by the Institute for Quantum Computing in conjunction with the University of Waterloo. Students will be given a first-hand look into one of the most exciting topics in modern science-quantum cryptography. Not only will students have the opportunity to be exposed to cutting-edge topics like quantum physics and cryptography - they will have the opportunity to meet some of the most renowned researchers the field has to offer. In addition, students will get a tour of quantum computing and quantum cryptography experiments. Whether or not you agree with the term “digital native” and what it stands for, this is an interesting infographic - from the Voxy Blog (where you can find full details of how to embed it on your blog). Because of the proliferation of new technologies, the younger generation today is outgrowing traditional forms of education – remember pencils, chalkboards, textbooks and graphing calculators? Whether we are in the car, on the train, at work, or in a classroom, mobile technology in particular is giving us the ability to learn on-the-go. See the infographic below to learn why we are wired for mobile learning, and how we can use mobile technologies to educate ourselves. Great stuff from Andy Ihnatko - particularly given his earlier glowing review of the Xoom. But you kind of have to hold the iPad 2 to really get the redesign. It’s thinner by a third, plus its edges taper to a thin line of metal. It’s almost inconceivable that this thing you’re holding is a multicore tablet computer. The Xoom tablet is trim, light, and very pretty ... but when you place it next to the iPad 2, it looks as though it was designed and built by angry Soviet prison labor instead of by Motorola. Not much of a teaser, but I'm intrigued. I wish we had a different word than book. "Book" brings with it a number of expectations that e-books don't satisfy. Additionally, when some thinks of a "book," their thinking is constrained – they don't open themselves up to the potential of what can be done on a digital device with digital content. Introducing Push Pop Press. Our team is bringing together great content and beautiful software to create a new breed of digital books. Books that let you explore photos, videos, music, maps, and interactive graphics, all through a new physics-based multi-touch user interface. Our first title will be available for iPad and iPhone later this year. We can't wait to share it with you. Great life advice from Garr Reynolds! Embrace failure. Today, while jogging up past some small farms in the mountains near our home in Nara, I passed through a familiar bamboo forest. But today something was different. I noticed one of the bamboo trees had given way and snapped during a strong wind we had recently. This caused me to take notice and slow down. We notice what is different, and if we slow down long enough a lesson may be revealed; this is a kind of "listening with the eyes." It seems that in a strong and unyielding wind, even the bend-but-don't-break adaptability of the humble bamboo will be tested to the point of failure. A subtle reminder from nature that even the strong and the courageous and the flexible fail sometimes. An old Japanese proverb says "Even monkeys fall from trees." (Saru mo ki kara ochiru — 猿も木から落ちる.) Somehow knowing this allows us to push past fear and to participate more fully as we embrace or own imperfections, even as we work to improve. An upgrade to one of my favorite Mac applications. DaisyDisk is a visually pleasing and emotionally satisfying application that spices up the often boring task of finding and removing space hogs on your Mac's hard drive. One of the critical additions? In-app file deletion! Read more at the DaisyDisk blog. A couple of years ago, smartphones were early adopter toys and mobile Internet practically unknown and undesired by the general public. Today, the picture is totally different. I have to admit that I am still surprised when I see people who are likely to be in their 60s with an iPhone browsing the web. But it's by far not an exception anymore. That also means that the target audience for smartphones has significantly shifted from only half a decade ago. Not a homogeneous early adopter audience anymore but anyone from student to retiree has now become a 'real' customer in this segment. I guess the plan is to get users 'hooked' on Blackboard, so that they'll beg their schools to move to Blackboard. Can't say I've met anyone 'hooked' on Blackboard - it's not exactly the crack of LMSes. You WILL kill people later. At a recent Teaching and Learning roundtable, we had a discussion about students cheating and plagiarizing in our classes. This is image pretty says it all.